We use only hand-selected quality meats: 6 oz. on the 7,” 8 oz. on the 12” and 12 oz. on the 16”. We serve 2 slices of your favorite cheese on our 7” subs, 3 slices on the 12” and 4 slices on the 16.” We use hearth-baked Italian bread baked by Amaroso Bakers in Philly, delivered fresh to us every morning. We now have 12” Hearth-Baked Whole Wheat Rolls. 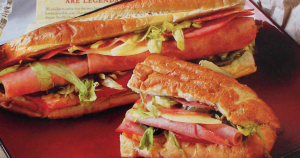 Our cold subs are built with lettuce, tomatoes, sweet Spanish onions, dill pickle slices, oregano and blended oil. At no additional charge, we will gladly add for you salad dressing (Kraft Miracle Whip) or Kraft Mayo, hot cherry peppers, banana pappers, jalapeño peppers, extra vegetables, or vinegar. Salami, provolone, pepper loaf, 98% fat-free Danish ham. Made in our store daily with fresh (never frozen) chicken breast. Chopped with celery, spices and Kraft Miracle Whip, topped with Provolone cheese. Genoa hard salami, provolone, cappicola ham, 98% fat-free danish ham. We double the meat and cheese on the regular large cold cut. On the 12”, half a pound of shaved ham with 5 slices of your favorite cheese. On the 16”, 3/4 of a pound of shaved ham with 7 slices of your favorite cheese. Sliced turkey breast, provolone cheese, shaved 98% fat-free ham. Make a CLUB SUB by adding bacon! Homemade with white albacore tuna, Kraft Miracle Whip, celery & spices, topped with provolone cheese. Crisp premium bacon with lettuce & tomato. Mayo on request. Fresh turkey breast topped with provolone.